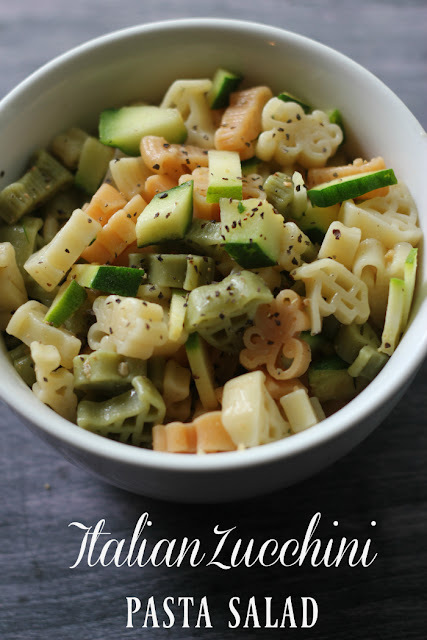 I enjoy trying new products and recipes with our meal plans, and this yummy Italian Zucchini Pasta Salad (inspired by a recipe from Wish-Bone) didn't disappoint! Cook pasta to al dente. Drain and rinse with cold water. Set aside. Meanwhile, wash and trim the end of the zucchini, then split lengthwise. Heat up the oil in medium-high heat in a saute pan, and place the zucchini cut side down in the oil. Cover with a lid and cook for 2-3 minutes on each side. Remove and allow to cool. Cut the zucchini into small chunks. Add to the pasta. Mix in the vinaigrette dressing and salt and pepper to taste. Chill one hour before serving! Links to shopping sites may be referral links.